Wildfires have swept Northern and Southern California. Please help our sisters and brothers rebuild the regions devastated by the fires. 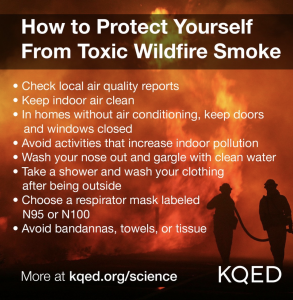 Below are resources for victims of wildfires and ways folks can help those affected. 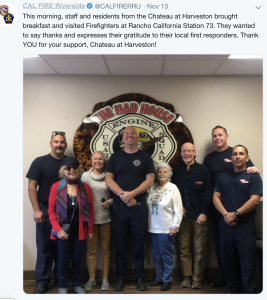 As part of the California Fire Foundation’s mission to provide victim assistance, it’s Supplying Aid to Victims of Emergency (SAVE) program provides emergency short-term financial assistance to fire and natural disaster victims in California year-round, including both firefighters and civilians. 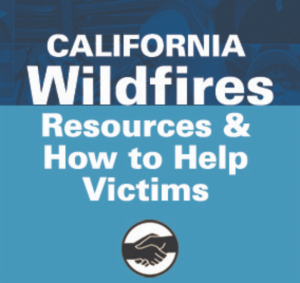 The California Fire Foundation has mobilized direct assistance to those who’ve suffered catastrophic losses in the Camp Fire and Woolsey Fire. Support the families of those devastated by the California wildfires by making a financial donation to the SEIU California Disaster Relief Fund which helps support members in times of need. 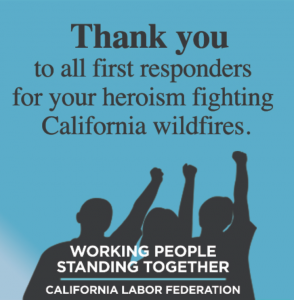 Hundreds of CSEA members and their families have been displaced or lost everything in the recent Camp Fire in Paradise, Butte County, as well as the wildfires in Ventura and Los Angeles counties. CSEA provides cash assistance up to $1,000 to members who have been evacuated or lost their home in these terrible fires. IBEW Local 1245 members have been hard-hit by the Camp Fire that is still raging in Butte County. Please donate what you can to help our brothers and sisters through this difficult time. If you or someone that you know has been displaced by the fire, please be sure to notify your Business Rep ( http://ibew1245.com/ask-your-rep/) so we can make sure that they have access to a share of this fund. The Fire in Butte County has destroyed thousands of homes, displaced members from their jobs, and had a devastating impact on our members in the area. UFCW 8 has created a fund for members in need of assistance. If you are a member in need of help please visit our website www.UFCW8.org/relief or call at (888) 834-4488. We can help. CDF Firefighters Benevolent Foundation, along with CAL FIRE Local 2881, is currently identifying CAL FIRE employees, CAL FIRE Retired, and other fire agency personnel who have lost their homes in the Valley and Butte Fires. The Foundation is issuing checks to these individuals to help with their immediate financial needs. The Camp Fire has destroyed Paradise, CA. We are collecting funds to help teachers and their families find housing, replace personal items, and just to show we care. Butte College Education Association GoFundMe accounts – one for faculty and one for students. It is our hope that together we can raise funding for Ironworker members who have lost their homes or who are unable to inhabit their homes in some cases due to lack of infrastructure. We would like to offer counseling for those who just need someone to talk to and help them cope with their loss and their experience. The funds will be administered by Greg McClelland of the LMCT and Karl Pineo of Ironworkers Local 118. UDW has created a relief fund for their members who have been impacted by the Camp Fire. Funds are needed for immediate relief such as food, clothing, gas and personal care items. Some IHSS providers and clients are also reporting an urgent need for wheelchairs, shower chairs and other durable medical equipment. As time goes on and the immediate tragedy gives way to long-term grief and rebuilding, these individuals will need secure housing, health care, employment and other tools to rebuild their lives. The CTA Chico RRC is also accepting donations of cash and practical gift cards for groceries or essentials. If you can provide housing, for those needing a place to stay, please call the RRC at (530) 345-9743. The Southern California Disaster Relief Fund will support our low-income neighbors whose lives and livelihoods are affected by the current wildfires in Southern California.Created by United Way of Greater Los Angeles, in partnership with United Way of Ventura County, the fund primarily provides longer-term support to help low-income individuals and families rebuild their lives. At last count, more than 11 SMMCTA members (along with numerous students and staff of Malibu Schools) have lost their homes in the Woolsey Fire. ALL money raised will be divided equally to these impacted members. We hope to raise enough money within the week to distribute funds as soon as possible and at the end of the campaign SMMCTA will provide transparent accounting. Note: These locations are where donated goods can be dropped off, as well as the location where survivors (customers) can pick up any needed donated supplies. Only new items will be accepted.